Steve Antley, design director for The Lakeland Ledger, shared pages he has designed and discussed how decisions are made on how to visually present a story. Most of his discussion was about design were about the print product, but he did mention a few coordinated effort between the print version and the online product. 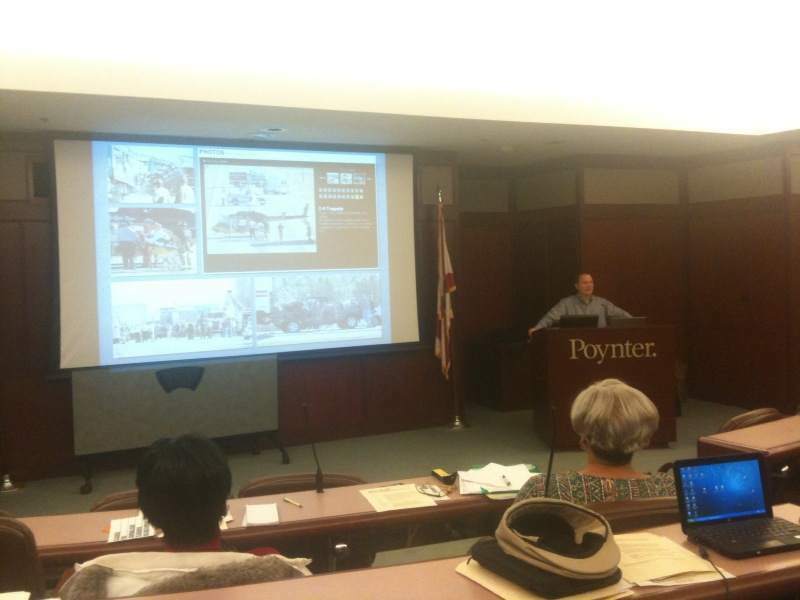 Steve Antley discusses pages that he has designed at the Lakeland Ledger. Breaking news — Designers may have only a few hours to create pages that convey breaking stories. He showed a front page of a major wreck. Charticales — Creating a visual way of explaining information that is part chart and part article. An example he showed was on the change in the minimum wage, which included the changes in expenses, such as home costs. Long-term projects — This requires planning ahead. The example he gave was a murder that was going to go to trial. The reporters and photographers followed the family of the murdered teen and the teen accused or murder and his family for almost a year that it took from the murder until the trial. Templates — The Lakeland Ledger has almost 200 templates in the design library. For example, The Ledger has six different nation designs and a dozen for the front page. This helps both in dealing with having fewer designers. Fonts — “Typography is part of your identify, and you don’t want to recreate it every week,” Steve said. His favorite headline type is Amplitude, with a variety of choices (condensed; light, medium and bold). The complimentary type is Kepler, the serif font. Body copy is Imperial, which is the New York Times body copy. Page size — All papers are downsizing to save the cost on newsprint. In order to share templates among the New York Times papers in Florida and Alabama, the papers are working to have the same newspaper dimensions. Steve said he was interested in The Berliner, which is a European size that developed for commuters. 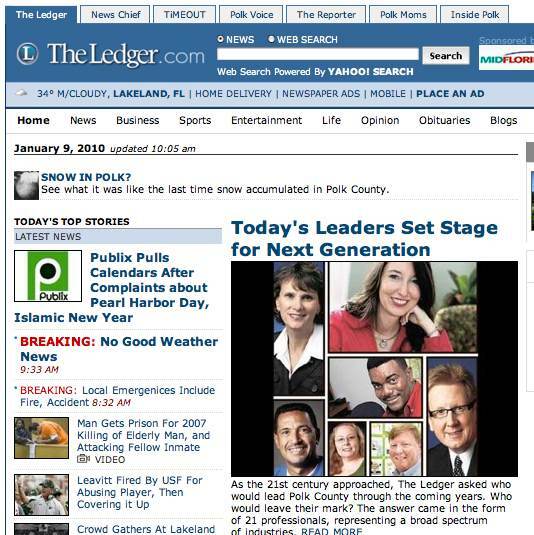 So what are the changes Steve sees at The Lakeland Ledger? Reporters who will go out with a camera or a videocamera on a story. Editors that are putting stories online story early — sometimes writing the story. Copy editors that are doing design — using the templates. Designers that are doing multimedia. What software and Web sites does Steve use and recommend? Software — Flash, Final Cut Pro (including Express version), Adobe Suite, Soundslides. Web sites — newsdesigner.com, newspagedesigner.com, Poynter and the Newseum, The Font Bureau, Adobe fonts (but you can’t use them all).